Easily transform your Thunderbolt 3™ equipped MacBook Pro or Windows laptop into a dual-4K workstation with up to 40Gbps of throughput. The high-quality TB3 dock features three USB 3.0 ports, 85W Power Delivery to charge your laptop. Great for video editing and other Ultra HD tasks, this dual-4K monitor docking station supports 40Gbps speeds and 4K resolution on two monitors. Run resource-demanding applications on two independent displays, without draining system resources. Simply connect the TB3 dock to your laptop with included TB3 cable and start working immediately. No time-consuming driver installations are required. 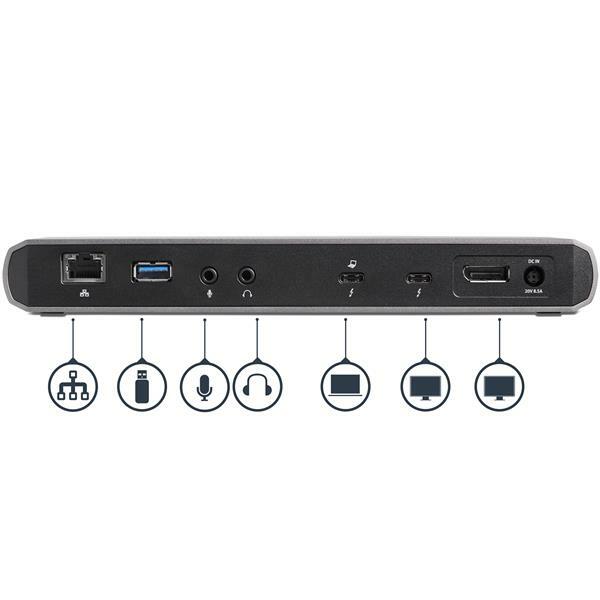 With three USB 3.0 ports, the Thunderbolt 3 docking station gives you plenty of ports for the latest and legacy devices. Connect USB devices like flash drives using the two Type-A ports. Keep your mobile device charged with the dock’s Fast-Charge and sync port. Connect a USB-C device with the USB-C port (5Gbps - data only). 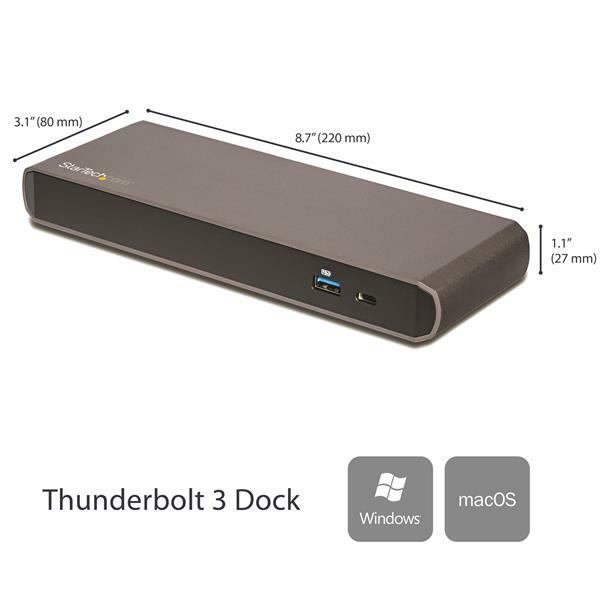 The Thunderbolt 3 docking station features a 170W power adapter supporting Power Delivery to power and charge (up to 85W) your laptop, while powering all your devices connected to the dock. 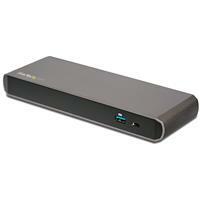 This eliminates the need to use two separate power adapters for your laptop and dock. TB3DK2DPPD features a rugged aluminum casing and is backed by a StarTech.com 3-year warranty and free lifetime technical support. Note A 4K-capable display is required to achieve 4K x 2K resolution (4K is also known as 4K x 2K). Certain monitors may be limited to 4K at 30Hz when connecting through DisplayPort. These monitors include the following models: Dell P2715Q, Viewsonic VX2475Smhl-4K, Philips 288P6LJEB, LG 31MU97C-B, Asus PB287Q (these models will need to be set to 4K at 30Hz). When connecting a display to one of the Thunderbolt 3 USB-C ports, a USB-C video adapter might be required depending on the input of your display. USB 3.0 is also known as USB 3.1 Gen 1; this connectivity standard offers speeds up to 5Gbps. USB 3.1 Gen 2 offers speeds up to 10Gbps. System and Cable Requirements Thunderbolt 3 equipped computer with a Thunderbolt 3 port. Your laptop's Thunderbolt 3 port must support USB Power Delivery 2.0 in order to power and charge your laptop. For an up-to-date-list of affected computers and instructions, visit https://thunderbolttechnology.net/updates. If your manufacturer isn’t listed on the Thunderbolt website, contact your manufacturer. What do I need to know about Thunderbolt 3 and power delivery? 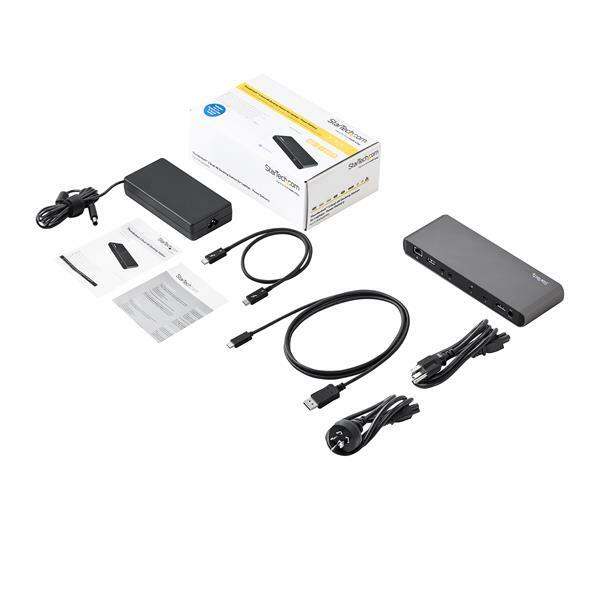 Thunderbolt™ 3 is capable of 100W of bi-directional power; however not all manufacturers will implement power delivery, or implement power delivery at the full 100W. Optical Thunderbolt 3 cables do not support power delivery at any wattage. What do I need to know about Thunderbolt 3 cables? 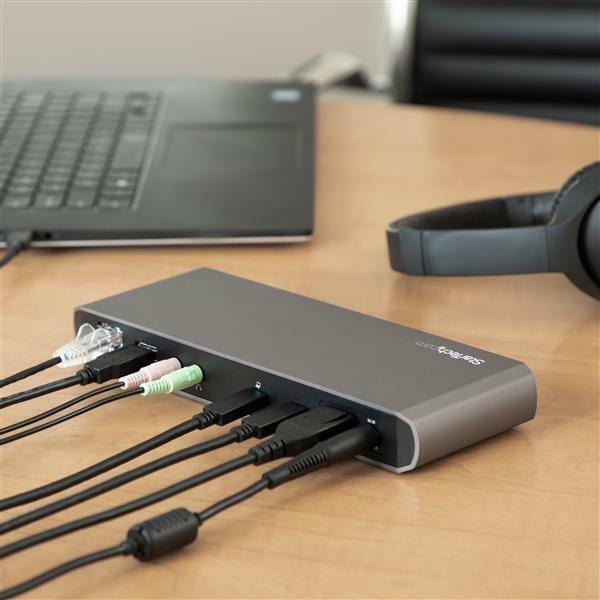 Although the Thunderbolt™ 3 standard is capable of data transfer speeds up to 40Gbps, not every cable can support this bandwidth. For example, cables over a certain length or made with certain materials are only capable of data transfer speeds up to 20Gbps. 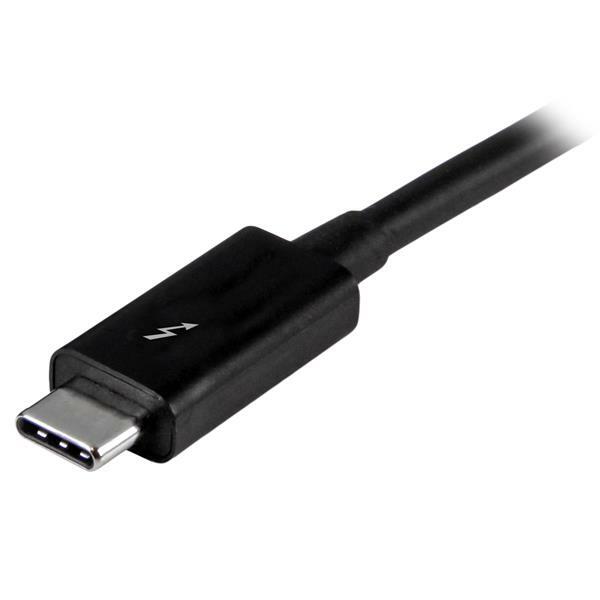 To confirm the capability of your Thunderbolt 3 cable, refer to the information provided by the manufacturer. 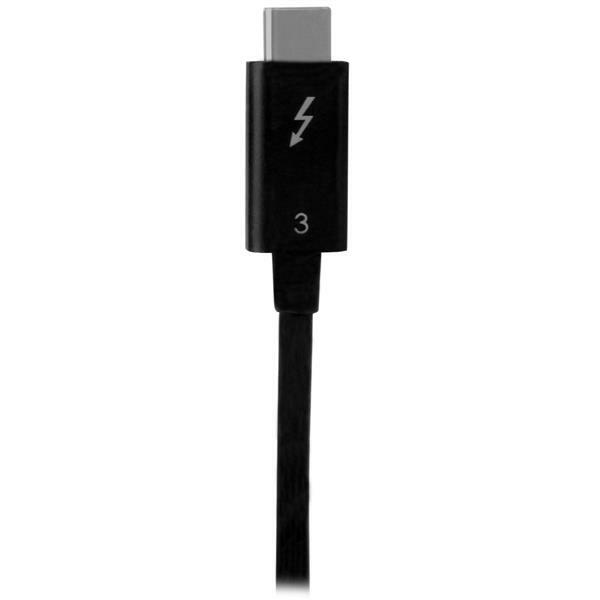 StarTech.com lists the capabilities of the Thunderbolt 3 cables on the individual product pages. There are two different Thunderbolt 3 cable symbols: the 20Gbps symbol and the 40Gbps symbol. The 20Gbps symbol is composed of the Thunderbolt 3 symbol, and the 40Gbps symbol is composed of the Thunderbolt 3 symbol and the number three. These images are shown below. What do I do if my display flickers when I use it with my laptop docking station? If you set your display to 4K@60Hz and connect a display to the DisplayPort output on the laptop docking station, your display may flicker. This issue only affects certain monitors and is a result of an interoperability issue between the hardware used in the display and the docking station. This issue is not specific to StarTech.com docking stations. Disable MST (Multi Stream Transport) or DisplayPort 1.2 mode on your display and enable 4K@30Hz. Refer to the information provided by the manufacturer for assistance. What do I do if only the video portion of my Thunderbolt device is working? Caution! If you select Do Not Connect, only video will pass through on your Thunderbolt 3 device. Good functionality but this is a business level product. Needs to work seemlessly with Skype. It worked great for 2 weeks for my Macbook Pro. USB devices stopped working after 2 weeks with the dock. Power delivery and displays still work. Now I need a separate dongle for my USB devices. Might try to return this device and get something else that works. Thank you for sharing your feedback on our TB3DK2DPPD docking station. We're so sorry to hear it hasn't worked well for you. For best results, we recommend using the included Thunderbolt 3 cable from us. We also recommend installing all available updates for your Mac. The docking station is covered by a 3 year warranty through StarTech.com and there is no cost to you to get the product replaced. Please feel free to live chat, or call us and we would be happy to troubleshoot the problem and send you a replacement if needed. Thank you for your feedback on TB3DK2DPPD. We apologize for the issues you've had with it and appreciate the troubleshooting you've done so far. We recommend reaching out to our Technical Advisors at www.startech.com/support for troubleshooting assistance to get everything working as it should be. We're available 24 hours a day, 5 days a week, to provide support. Got it to connect to a Dell Displayport to my Macbook pro 15 running the latest Mojave OS. The power via USB-C works great. Unfortunately, nothing else does. The USB-C to Displayport is not recognized at all - the Macbook gives an error that the thunderbolt device is not supported. My display also has an HDMI in, so I used Apple original HDMI-USB-C adapter and still the same error. I then connect the display directly to the Macbook and it works flawlessly, including sending the power through the Apple adapter. So at this time, the dock is acting as a super-expensive power supply! Thanks for sharing this feedback. We're sorry our docking station hasn't worked well and we'd like to help. We'd like to know more about your configuration so we can closer look into the issue you are seeing. Specifically which year your MacBook Pro is from. We have free Technical Support ready 24 hours, 5 days a week, should you encounter any problems. We can even arrange a remote support session to look at the issue along with you. To contact our Technical Support team, please click on Support at the top of this web page. Had this unit for a few months and all was well until I networked it with a few other computers in my studio. AWFUL noise and static/crackles/whining coming through my audio monitors. Started trouble shooting to narrow down the culprit and its the cheap power supply on this dock. If I switch to the supplied Apple power supply, all is golden but I have to plug all my devices straight into the MacBook Pro which defeats the purpose of the dock. If anyone has any ideas how to fix this PLEASE enlighten me! We apologize for the issue you're experiencing with the TB3DK2DPPD and power adapter in your setup, and would like to look into this further. I've reached out by email, so we can gather more details and work towards a solution. I bought this to use with my Macbook Pro 15, 2017. After reading the issues that primarily involved (Windows) drivers and cabling, I paired it with a Nekteck TB3 cable to the dock, and a Club3d CAC-1066 DP cable to a ThinkVision L27q (4k, 60Hz). Plus a Cat6 cable and a Logitech wireless USB receiver. Audio jacks are recognized and work fine. Can't speak to dual displays, but if you do, watch what HDMI port you use on your monitor, not all of them support 4k60Hz. (Ran into that with a Samsung 4k monitor + Radeon Pro card.) Here's my gripe, and I'm not sure where the breakdown is: The USB 3.0 ports on the monitor do not work unless the monitor is driven by the USB 3.0 connection, not DP. When both DP and USB cables are connected, the MBP thinks there are three displays, even though I only have one selected (obviously). Maybe its a firmware issue with the L27u, maybe the Dock, maybe the MBP. Not sure. This means that I can't plug in my factory USB soundbar, the Logitech receiver, or anything else into the 4 USB ports on the monitor. And since there's only 2 USB 2.0 ports on the dock, it limits the number of devices I can use at once. Just something to think about, but overall its a very good dock. Looks great on my desk too! (4 stars) Love this little thing! Use it mainly with my Macbook. Tested with a friend's Dell. In both cases, it just worked. Small, flat, hardly noticable. Feeds power through just fine, drives 4k via DP without an issue. Added 2nd HDMI monitor via adapter cable, and that was no issue either! Sometimes on the Macbook, after coming out of sleep, I need to disconnect the dock and reconnect, and then all is well. But it's not consistent, and not frequent. What I'd like to see is Mac compatible docks that have an option in the driver to tell OSX to disable/dim the built-in screen. But that's a wishlist, not a fault of this little beastie. Power pass through is appreciated, as I can leave my adapter in the bag, drop the computer on the desk and connect ONE cable. Would like to see an additional USB-C and USB-A on the front of the dock, as I tend to connect a thumb-drive and charge my phone, but I can work around that. Just a 'nice to have'. If there was a way to make this backward compatible with TB2... THEN it would be perfect. :) Overall though, SOLID build, decent port placement, great size, and near flawless performance (other than the reconnect/sleep thing I mentioned). I received this product in exchange for an unbiased review. And have already purchased an additional one for the Mrs.!! Purchased to work with my HP Spectra x360 15in 2017. It does not work with two monitors out of the box with the supplied drivers. Windows 10 Pro 64 is up-to-date, computer is up-to-date with all Intel and HP updates.. I am waiting for a reply from technical support. Everything works perfectly when I plug in my Mac. So I know it is not a cable issue. It is my Windows 10 work computer I need it for. It works with 1 monitor attached. I can get two external monitors to work if I plug one into the computer's HDMI port, but that is not why I purchased it. Thanks for sharing your experience with us. We hope we can help. In order for two monitors to work, one needs to be connected to the DisplayPort port on the back of the dock, and the other to the Thunderbolt 3 (Type-C) port also on the BACK of the dock (beside the DP port). The Type-C port on the front of the dock is data-only and cannot be used for a monitor connection. We have also replied to your support email with some further questions. We also have Technical Support Advisors available 24 hours, 5 days a week for live support by chat or phone. I have used this docking station for a few weeks with just my Lenovo T470 laptop and it works very well. I have attempted to connect other devices (that don't have Thunderbolt 3) but none of them work. The dock comes in a box about the size and weight of a brick. It was much heavier than I expected. Both the dock itself and the large power supply are equally heavy. The dock is made of medal and is very study and nicely built. The doc is about the same size as a large laptop power brick, which it comes with to power itself and the host device. I very much like the look of this dock on my desk. It has both a USB-C and USB-A 3.0 port on the front as well on the back it has these two ports again plus network, display port and headphone out then power, microphone and USB-C in. The doc connects very quickly when Windows has started. Only a couple of seconds and everything is working great. The docking station was able to keep my computer charged without any problem. My complaint with this product is it pretty much doesn't work with anything that does not have Thunderbolt 3. I tried using it with many other USB-C devices but nothing would work (charging, display, USB or network). I can get all of these working with single purpose USB-C adaptors but not this dock. This docking station does a very good job and looks very nice. It will likely replace every docking station in my office at some point in the future once all laptops support Thunderbolt 3. I received this product in exchange for an unbiased review. (4 stars) Power delivery dock all in one! What a great little dock! So the first thing you will notice that that this dock has some weight to it. I have tried some competitors docks before and some are much lighter. Now I prefer the fact that this has some weight and I found it helped to keep all the cables etc where I want them and not where the cables wanted to go. 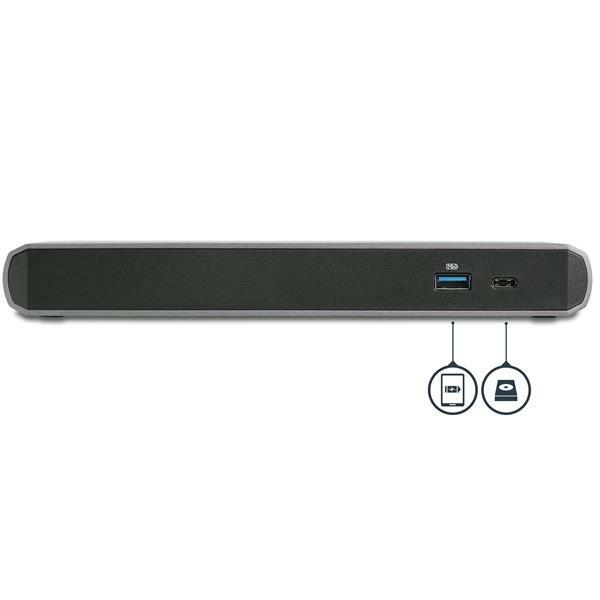 This dock offers multiple thunderbolt 3 ports, Displayport, Usb-3.0, ethernet and audio in/out along with power delivery. I tested this with my MacBook pro and found it worked like a charm. I tested with my external monitor and had no issues at all. Now I could not test at 4k as my monitor does not support it. But at 1080P this unit worked perfectly. This is a great options for people who want to leave all the cables hooked up and just plug the laptop in and off we go! I would recommend this unit to anyone looking for a well built and solid dock. Far better then most of the competition. "I received this product in exchange for an unbiased review"